The Memorial Hall clock, which has been there for longer than any of us can remember, fell into disrepair in 2011 so it was removed and taken along to Marvin Richards, our local watch and clock maker and repairer. On examination, Marvin found that it was no small job to put it right and it posed him one big challenge if he was ever to get it going again. 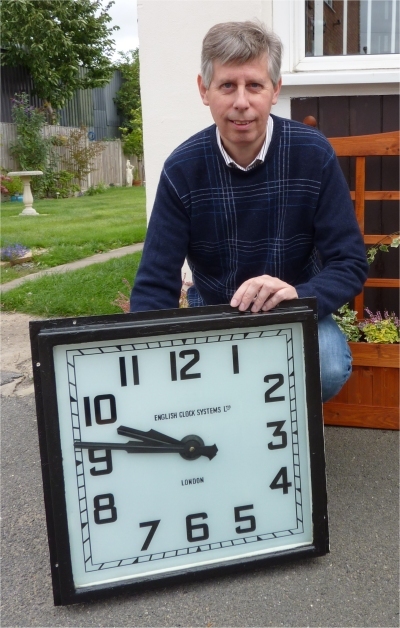 Here is Marvin’s story of how he managed to restore the clock to its former glory. “After many hours of ringing other clock repairers, searching the internet and trying to find someone with the specialised equipment to make new parts, all to no avail, I had just about given up all hope of being able to repair it. Then, in the summer, I visited the Birmingham Clock and Watch Fair, where, by pure chance, I came across a similar Smith’s electric clock, complete. I couldn’t believe my luck. I bargained down the price, bought the clock and brought it home. “I had already taken apart, cleaned and repaired the original electric movement of our clock. However, the drive shaft wheel which was made from brass was totally worn out and the clock couldn’t work without this essential part. Although the two movements were different, I was able to use the important parts from both clocks to make one good one, after many neck aching hours at the work bench and a few choice words. The Memorial Hall Committee is extremely grateful to Marvin who has put in countless hours of patient work. He was determined not to be beaten and his efforts paid off. He is delighted that he has been able to repair the clock which has been part of our Stilton heritage for so many years and so do his part for the village. Chris Walford and Ivan Greenfield reinstalled the clock into its original place over the entrance to the Hall in time for Remembrance Day, where it is a pleasure for all to see giving us the correct time. Rob Tappenden (Retelec) has kindly offered to illuminate it to show it to best advantage so that the time can be clearly seen in the evening. Marvin’s father Kurt, and now Marvin have, for the past 20 years or more, always serviced the clock free of charge. Marvin, like his father, is a very skilled craftsman. He not only repairs watches and clocks but when he has the time, restores and makes some beautiful timepieces. If you have never visited his workshop, then you should. You may even find that special present you have been looking for!